If you’re going to be using cold emails and cold calls, you can actually even improve their success by applying an inbound marketing strategy. 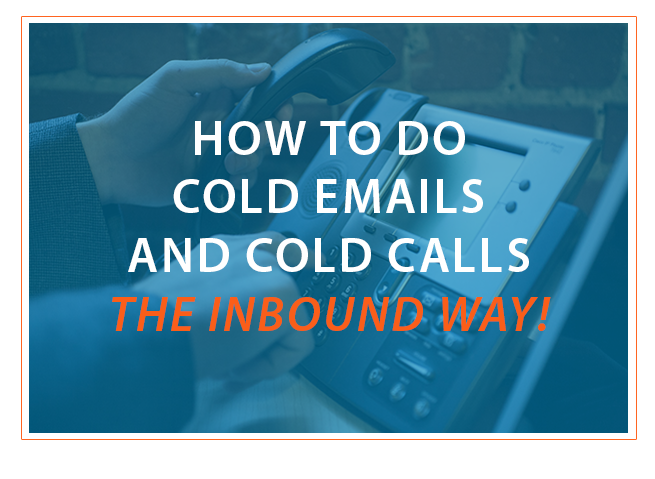 Here is how to do cold emails and cold calls the inbound way. Inbound marketing often identifies buyer personas on email accounts based off of the content that lead the customer to subscribe with their email address. However, an inbound marketing expert will know that identifying a buyer persona can be done at any point in time. In your cold emails, simply direct your recipients to identify themselves as one of your buyer personas. Once you have that information, the recipient isn’t really a cold lead from a list anymore; he or she is a segmented audience with enough interest to tell you how they fit into your company’s big picture! Add these formerly-cold email addresses to your email lead nurturing workflow customized for the buyer persona. With that personal touch, your audience will like you and engage with you more than before. Learn whether the audience fits into one of your buyer personas through a conversation about the customer’s needs. The needs-based conversation should lead to identifying your contact’s pain points so you can send them valuable content to help them right away. Tailor your call call sales approach to the buyer’s persona the same way you would target emails and content to a buyer persona through an inbound marketing strategy. While you know that even cold emails should end with a call to action for your audience, your cold calls should also hinge on a call to action. The traditional marketing method is to make a sales pitch the only call to action for a phone call. But if you identify that your lead is really at a different phase of the buyer’s journey, your call to action should be getting them back into your email workflow like any other completely inbound lead. Rather than sending them to a landing page, tell your customers the value of your content and premium offers. Show them how your emails will alleviate their pain points. Obtain their information willingly and subscribe for them. This added effort will eliminate the black-and-white mentality of either selling immediately, trying to sell again later, or moving on entirely. Nurture your cold call leads with inbound strategies. A solid inbound marketing strategy start with goals that are specific, measurable, attainable, relevant, and time-bound (SMART.) Any inbound marketing expert will tell you that these same goals can be used to guide your outbound marketing strategy as well. Set goals for the number of calls and emails made and buyer personas identified. Identify the current and ideal conversion rates of cold calls and cold emails to save time. Set a time frame for your target customer conversions and determine what call and email activities will lead to your goal. Unify your SMART goals for inbound and outbound marketing. Operating the cold calls and email lists with separate metrics makes sense from a fine-tuning standpoint, but your marketing department still functions as a whole. Look at the rate of return for each method and see how you can expand on areas that aren’t maxed out on potential. Setting goals for the department as a whole can really put your marketing hours and dollars into perspective. Having marketing and sales alignment is already a challenge when pairing up inbound marketing and inbound sales alone. Now you have to align outbound marketing with outbound sales, and then match those up with your inbound marketing and sales! Create a master document for all sales and marketing personnel that identifies key talking points about your company’s strengths. Get your sales team familiar with your blog and premium content offerings so they can quote the material and use it to alleviate audience pain points in the sales process. If the sales team identifies a piece of content that they need to educate and nurture prospects, create it for them! Have the marketing team create buyer personas based on what the sales team knows about customers, then use those personas to generate specific content. There are certain industries where potential customers simply expect cold emails and cold calls, and sometimes a tried and true method works for a particular company. There is no one-size-fits-all marketing method, so you’ll have to increase or decrease inbound and outbound marketing to maximize potential. After all, one method might be more effective only for a small audience. Once that audience has been completely tapped, your second marketing method will become exponentially more valuable. If your company is only running outbound marketing, consider outsourcing to an inbound marketing expert to leverage the business you have never reached before. Remember That Part About S.M.A.R.T. Goals? Effective marketing strategies - whether outbound or inbound - all begin with SMART goals. Use our free SMART Goals template to create goals for your business that are Specifica, Measurable, Attainable, Relevant, and Timebound. Click below to get your template.